This bicycle tour is an off-traffic, moderate difficulty sightseeing tour on Asian coast of Istanbul. It includes a 10 km coast from Kadıköy Harbor, to Bostancı, a ferry ride, a 7 km loop in Heybeliada (one of Princess Islands) and another ferry ride back to Kadıköy. You will get two see the best of the Asian side in Istanbul. This tour is suitable for kids of 8 years and up. You will have the option to walk or take horse cart ride (not included) in Heybeliada, if you prefer. please contact us for group discounts (more than 6 people) and bike arrangements. This is a popular route for the Istanbul residents (especially on the weekends). You will get a chance to see what regular people do in Istanbul as pastime. Click here to see the tour on a larger map of Istanbul. 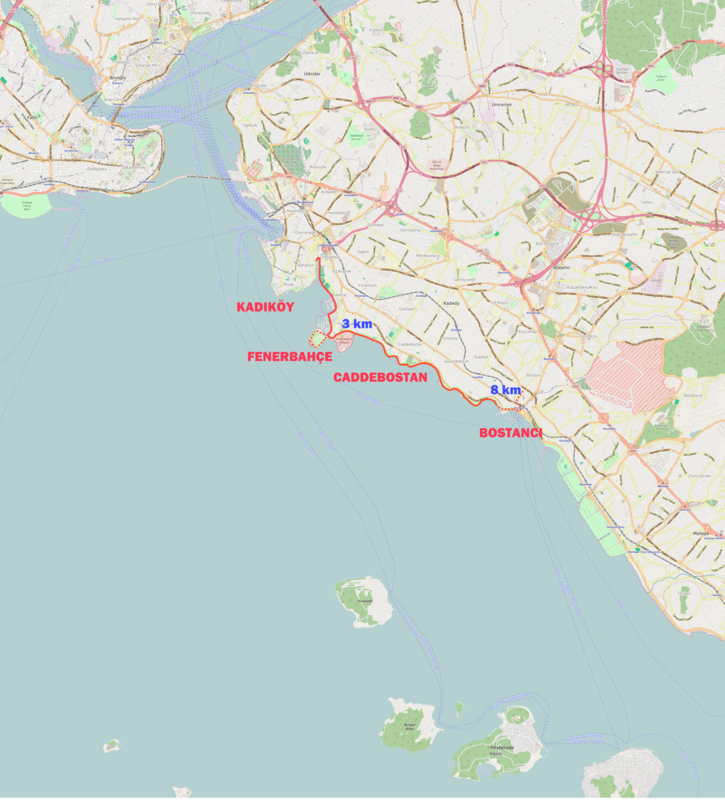 You can take the ferries from Eminönü ,Karaköy, Kabataş or Beşiktaş to get to Kadıköy. There are 2-3 ferries per hour, the trip 20 minutes to get to Kadıköy. From the ferry station, it should take 10-20 minutes to walk to Yoğurtçu Park. Click here for ferry timetable. You can also take the Metrobus line if you live near it. We advise against taking a bus or dolmuş due to traffic, yet it is relatively better to cross Europ to Asia. You can check online for estimated times, and plan accordingly: there are buses and yellow dolmuş from Taksim Square straight to Kadıköy. Here is an excellent guide that explains how to get to Kadıköy from the European side. Contact us if you need directions. This entry was posted in English and tagged Bostancı, cycling, easy, Istanbul, Kadıköy, tour. Bookmark the permalink.